Tomatoes, black olives, and capers give this grilled swordfish recipe with Sicilian sauce plenty of vibrant flavor. Make the easy sauce ahead of time and reheat while you're grilling the swordfish. This is one of our favorite seafood recipes because the robust flavor of the sauce is the perfect balance for the delicious grilled swordfish steaks. No one ever guesses the "secret" ingredient - anchovies - in this grilled swordfish recipe with Sicilian sauce because you can't really taste them. However, they give the sauce a fabulous flavor that makes everyone want second helpings. 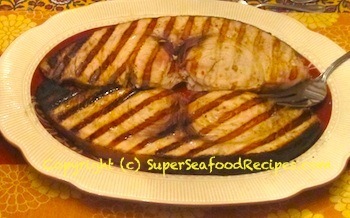 To keep the swordfish moist while grilling, marinade it in olive oil, lemon juice, and fresh time for half an hour. Grilling time depends on the thickness of the swordfish steaks and the temperature of your grill - the steaks in the photo measured about 1 1/4 inch thick. We grilled them for about 5 minutes on each side. If you're really in a hurry (or feeling lazy), the grilled swordfish is also fabulous without the sauce - but we love the savory flavors of this Sicilian sauce so much we always make it. Put the 1/4 cup olive oil and lemon juice in a dish large enough to hold the swordfish steaks in one layer. Add the swordfish, turning once to coat each side with the marinade. Season the swordfish with salt and pepper, and put into the refrigerator to marinate for 30 - 60 minutes. We usually make the sauce while the swordfish marinates. 1. Heat the olive oil in a skillet over medium heat. Add the onion, garlic, anchovy fillets, and red pepper flakes. Saute, stirring occasionally, until the onions begin to turn brown - usually about 7-8 minutes. Add half the tomatoes, and cook for 3-4 minutes until they begin to soften. 2. 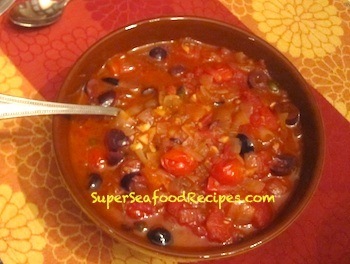 Add the rest of the tomatoes, the olives, capers, and black pepper. Heat through. Taste, and add a little more salt if necessary. Remove from the heat. Stir in the basil. Alternately, you can make the sauce (except for adding the basil) up to 2 days ahead and keep in the refrigerator until you're ready to make the fish. Reheat while the fish cooks, and stir in the basil just before serving. 1. Remove the swordfish from the refrigerator about 1/2 hour before you want to grill it. 2. Pre-heat your grill to medium-high. 3. Remove the swordfish steaks from the marinade, and shake off the excess. Grill for 4-5 minutes on each side, until the steaks are cooked through. 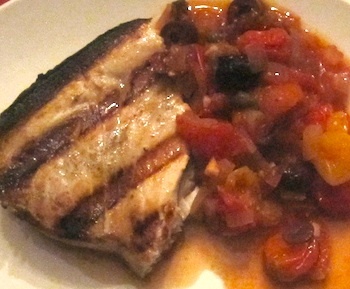 Put the swordfish steaks on a platter and serve immediately, with the Sicilian sauce in a bowl on the side. The full-flavored swordfish with Sicilian sauce goes well with white rice or couscous, and a green vegetable, such as green beans and sliced garlic sauteed in olive oil.